My husband, son, and I stayed here for 4 nights in March and very much enjoyed the experience. The house was far enough away from town to feel like we were &quot;in the country&quot; but close enough to easily walk, bike, or drive back to town. The house was clean, had two bedrooms and bathrooms, and a well stocked kitchen. We used the outdoor patio continuously, and never had problems with the wifi. My only suggestion would be for the house to be stocked with more and better linens. Atacama is a very dusty place, and we quickly went through the towels provided, and there is no washer and dryer. Also, the sheets on both beds were old, didn't fit the mattresses well, the pillows were lumpy, and the comforters very scratchy. Two new sets of linens for the bedrooms is all it would need. Warnings: the markets in Atacama are so tiny that many of the basic kitchen necessities were hard to find. 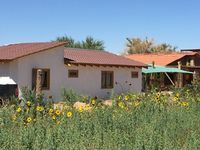 If you really want to take advantage of this house and being able to cook your own meals, buy your groceries in Calama before you leave for Atacama. There are many dogs (and 1 cat) who visited the house. Our son loved them, fed them, and had constant company. If you don't like dogs, don't feed them! Like almost all rentals in Europe and South America, there are no screens on the windows. So if you want to cool the house down at night, you risk letting mosquitoes in. A few fans added to the bedrooms would be helpful.